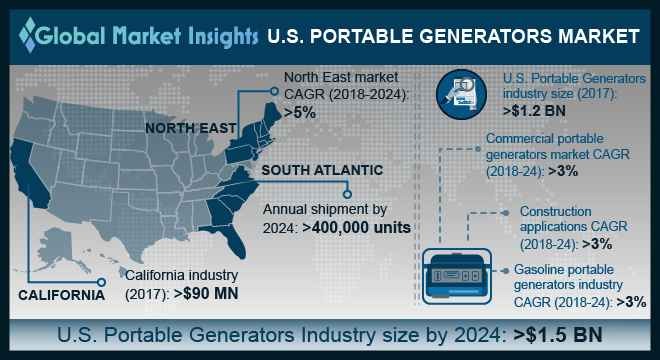 U.S. Portable Generators Market size will exceed USD 1.5 Billion by 2024, as reported in the latest study by Global Market Insights, Inc.
Increasing severity and recurrence of weather related disasters will drive the U.S. portable generators market size. According to the U.S. Department of Energy, weather outages are expected to rise as climate change increases the intensity and frequency of blizzards, floods, hurricanes, and other adverse weather events. Recent instances majorly include the Hurricane Harvey, a category 4 storm that resulted into a massive power outage across Texas, affecting more than 336,000 customers. California portable generators market, in 2017 was valued over USD 90 million. Increasing load on power grid driven by elevating heat temperatures across the state will favor product deployment. For instance, excessive use of air conditioning on account of triple digit temperatures strained the California Power Grid in 2017, resulting into widespread and severe power outages. Declining resiliency along with growing vulnerability of electrical grid infrastructure will augment the U.S. portable generators market. Increasing frequency of grid failures on account of inability to sustain amplified demand load and high susceptibility to extreme weather conditions will favor the industry growth. South Atlantic portable generators market is anticipated to witness a robust growth on account of increasingly active Atlantic hurricane season. In 2017, the region witnessed one of the most hyperactive and destructive hurricane season, including the 18 storms and 6 hurricanes of Category 3 and stronger. The ever-increasing intensity of the hurricane season accompanied by expanding power outages will stimulate the product penetration. Construction applications is anticipated to expand over 3% by 2024. These products find wide acceptance across job sites to cater continuous and reliable power supply to construction equipment and tools. The industry growth is largely attributed to escalating need for continuous and reliable electric supply across construction sites. Ability to offer safe operations coupled with relatively lower costs of compliance with emissions regulations will drive the Class I engines portable generators market. These products are primarily deployed across lower power rating generators to cater backup power solutions across the residential and commercial establishments. Gasoline portable generators market is set to witness gain of over 3 % by 2024. Ease of fuel accessibility during an emergency or natural calamity will substantially encourage the deployment of these generators. Competitive fuel price, portability and easier availability of gasoline will make its adoption preferable over other fuels. Key industry participants include Cummins, Kohler, Generac, Briggs & Stratton, Yamaha Motor, Eaton, Honda Motor, Yanmar, Caterpillar, Honeywell, Kubota Atlas Copco, Siemens, John Deere and others.